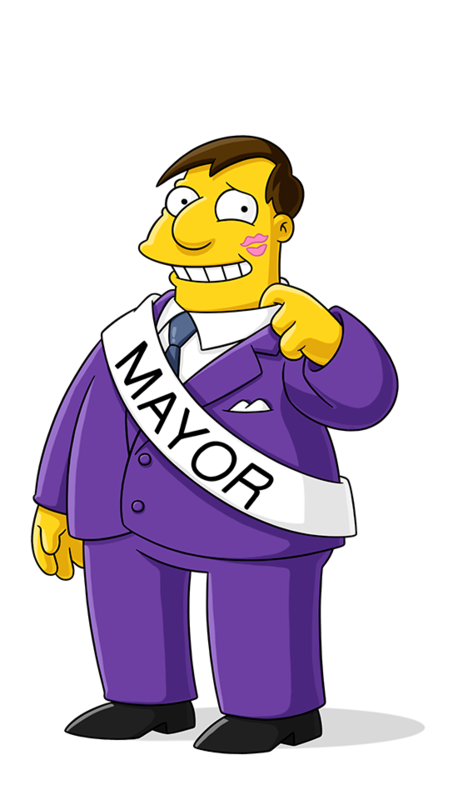 aka: Diamond Joe Quimby -- 3rd term Mayor of Springfield. With a Kennedy-style Boston voice, he has a penchant for victorious public appearances. Always covers microphone before a speech and whispers to aides: "Look at the scum out there, I need a shower and a drink." He also chooses inopportune times to relay to Chief Wiggum, "That reminds me, here's your monthly kickback." Using the pickup line: "How would you like a street named after you?" Campaign commercial for Mayor Quimby's reelection. Jimbo places campaign stickers all over Milhouse. Homer becomes the new chief of police in Springfield. Do you mind? You're killing the romance in here!